The Berghaus Storm Overtrousers are a versatile simple waterproof pant. 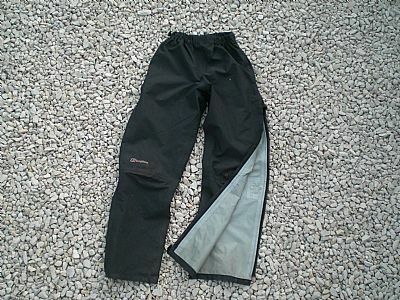 The simplistic design helps to keep the weight low - 407g for size small men’s is good for a 3 layer Gore-Tex trouser. An elastic waist helps to avoid the need for readjustment and the three quarter length side zips make getting them on and off far easier. At the top of the side zips is a venting zip (zipping down to allow air in) making changeable weather conditions far more pleasant. The side zips are protected by a double baffle, which when neatly folded together offers excellent protection and makes for an easy to use side zip. However, I have experienced (particularly on ascents) leaking around the knee from bending my leg; this allows the outer baffle to open partially and subsequently allow rain in. The 3 layer Gore-Tex fabric is durable enough for most hill walking exploits. However, if using them in winter be aware of crampons propensity for shredding waterproof trousers. Whilst the Berghaus Storm Overtrousers make an excellent year round waterproof trouser it is worth differentiating them from more dedicated winter waterproof trousers and salopettes featuring kick strips (reinforcements to protect the ankle and lower calf from crampons). Whilst on the subject of the fabric it is worth noting that this my second pair of these trousers as the first pair delaminated. The process of delaminating is not isolated purely to either Berghaus or this particular 3 layer Gore-Tex and could be seen on many other items. The Berghaus Storm Overtrousers are well designed, provide good durability and are a very pleasant change for hill walkers used to wrestling on non-breathable waterproof trousers as well as to the more adventurous mountaineer looking for a solid but light waterproof trouser.